It may be better to regard idealism and realism “not a the biographical equivalent of positive and negative electrical charges – either one of the other – but rather the opposite ends of the spectrum along which we act as circumstances require,” responded Gaddis. Some people gravitate to one pole or the other throughput their career, while still “others achieve Scott Fitzgerald’s standard for ‘first rate intelligence’ — they hold opposing ideas in mind simultaneously, and adjust in line of life’s un-predictabilities,” explained the renowned diplomatic historian. I suppose that a shorter answer to Fergusson’s query would have been that it was difficult to pigeonhole any statesman as either an idealist or a realist. The bottom line was that “it depends.” Perhaps Kissinger was a realistic idealist or an idealistic realist? Gaddis and Fergusson contrasted the idealists with the realists in order to analyse the way American policymakers had managed the Cold War strategy, especially when it came to issues of war and peace. For most of the Cold War era, the narrative embraced by pundits held that foreign policy decisions were outcomes of never-ending struggles between realists aka “hawks” – those who were advocating a tough U.S. posture vis-à-vis and the Soviet Union and its allies – and the idealists aka “doves” – those who were advancing a more conciliatory approach towards America’s leading global rival. In reality, another bird, the owl, seemed to have had won the war. Now in the post-Cold-War era of globalisation, and in the aftermath of Brexit and the election of Donald Trump, we seem to be falling again into the same kind of intellectual trap of either/or. The impression now is that our global policy debate is between “nationalists” and “globalists,” and that the decisions being made in Washington reflect the balance of power between these two opposing forces. According to this narrative, Trumpism and the populist movements in Europe, are part of a pushback against international trade and immigration by the nationalists, backed by blue-collar workers who and the victims of deindustrialisation. They are challenging the liberal international order being defended by the beleaguered globalists, supported by the urban elites who have benefited from globalisation. This narrative posits a false dichotomy between the nationalists, who are accused of promoting the anachronistic values of identity, and the globalists who supposedly want to see a world free of ethnic and religious conflicts. It certainly does not capture the political complexities that have been ushered in by the forces of globalisation since the early 1990s when governments started fast-track the liberalisation of the global trade system, and to remove restrictions on immigration. It does not explain, for example, why the rise of nationalism in Catalonia, in Scotland or in northern Italy has been taking place in the last two decades, just as these regions have been experiencing tremendous economic growth fuelled by globalisation. In reality, what has happened is that the grand theory that assumed that economic forces of globalisation would overcome nationalism and ethnic and religious conflicts proved to be an illusion. It is the ideology of globalism constructed around the notion of economic determinism that lost momentum, not the process of globalisation itself. Humans desire to preserve their individual identity, and to gain economic freedom. But they also want to belong to a group and to maintain a sense of collective identity. When these two colliding needs are not in balance, a political backlash to achieve new equilibrium is inevitable. From that perspective, Trumpism is not part of a global trend to eradicate free markets, international trade, and immigration. Their goal is to achieve a new equilibrium between the forces of globalisation and nationalism. They do not represent a revolutionary movement but an attempt to restore some of the foundations of the liberal international order that existed before the engines of globalisation started roaring in the 1990s. It is important that we identify the roots of the political and economic changes that led to rise of Trumpism, in order to understand the policy choices that have been made by President Trump. In particular, we need to reject the notion that President Trump and his supporters, the proponents of Brexit, or for that matter, those who voted for the populist parties Italy in the last election, are a bunch of xenophobes opposed to all forms of global commercial integration and immigration. What these voters are demanding is a slowdown of the efforts to liberalize global trade and open borders to new immigration. They support taking “time out” and reassess some aspects of the ambitious globalisation agenda. They believe that supranational institutions will need to return more power to national governments, that existing national security commitments need to be reassessed, that free-trade agreements may have to be renegotiated, and that immigration policy must be based on economic, national security, and cultural considerations. Embracing such changes, as President Trump has done, does not amount to buying into protectionism, nativism or racism. It seems to be a sensible response to the legitimate concerns of his voters, and it suggests he does not have only two policy options to choose from in the coming years: Either nationalism or globalization. Instead, he can embrace a mix of policy options that continue to promote globalization while at the same time, protect national security and economic interests, in the same way that most presidents have done in the past. 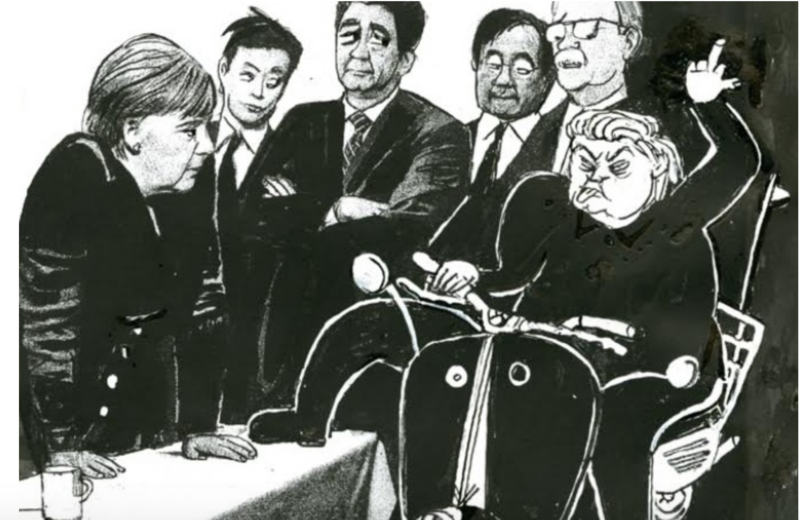 In fact, there is nothing new about U.S. administrations being drawn into trade disputes with America’s economic partners, or for that matter, about them pushing for protectionist measures against allies like Germany or Japan. For much of the 1980’s, the United States and Japan were engaged in numerous trade quarrels, Japan, like China, was accused of “stealing” American jobs and pursuing unfair trade practices. In response, American presidents, committed as they were to free trade principles, ended up imposing major tariffs on Japanese imports, creating a sense of crisis between the two allies. At the same time, U.S. officials threatened to impose stiff tariffs on European products as part of a strategy to press its trans-Atlantic allies to make concessions during trade negotiations. Like in the case of Japan, these trade squabbles with the Europeans, ignited fears of global trade wars and collapse of the post-World War II Western alliances. Yet the post-1945 international order remained in place then and will probably survive under President Trump. From that perspective, what is being described as the rise of nationalism reflects sentiments among citizens that their governments and elites return to the original strategy of the post-1945 project, which included a good deal of economic nationalism and restrictions on immigration. Or to paraphrase Gaddis, globalisation and nationalism are not the equivalent of positive and negative electrical charges – either one of the other – but rather the opposite ends of the spectrum along which we act as circumstances require. We are all Globalnationalists now. Please head over to The Spectator to continue reading truly excellent pieces. Previous Space-Based Missile Defense Needed NOW!